The amazing new book that unlocks a world of personal happiness and extraordinary achievement! One of the world's most influential writers shares one of the world's greatest secrets for your personal and financial success . . . in his dynamic sequel to The Greatest Salesman in the World, Og Mandino's Spellbinding Bestseller.Featuring your own Success Recorder Diary With The Ten Great Scrolls For Success.“This tremendously challenging book will inspire the reader to realize his moral, spiritual, and financial goals!”—Wallace E. Johnson, Vice Chairman, Holiday Inns, Inc.“It's inspiring. It's terrific! It motivates the reader.”—W. Clement Stone, Chairman and CEO, Combined Insurance Company of America“Tremendous! 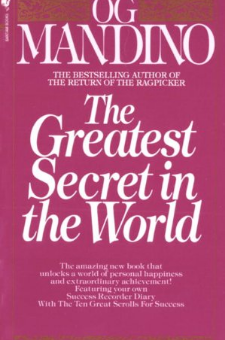 Og Mandino has created another living classic that will touch the lives of millions.”—Charles “T.” Jones, President, Life Management Services, Inc.